The Aggies begin their quest to repeat as conference champions. It’s time to Aggie Up at the Pan American Center, where the New Mexico State University men’s basketball season promises a tough schedule and dramatic spectating. The defending Western Athletic Conference champs open the season at home November 6, against North Dakota State, followed by interstate rival UTEP on November 9. The Aggies will take on perennially ranked Saint Mary’s on November 14 before hitting the road to the Pit for a showdown with you-know-who in Albuquerque on November 17. If you can’t make the trip, the WAC champs will re-create the magic against the Lobos at Pan Am Center on December 4. Or dab on the face paint for a pre–Turkey Day matchup against Eastern New Mexico on November 21. The home lineup for the remainder of the year includes Washington State (December 1), Northern Colorado (December 17), and Cal State Northridge (December 19). 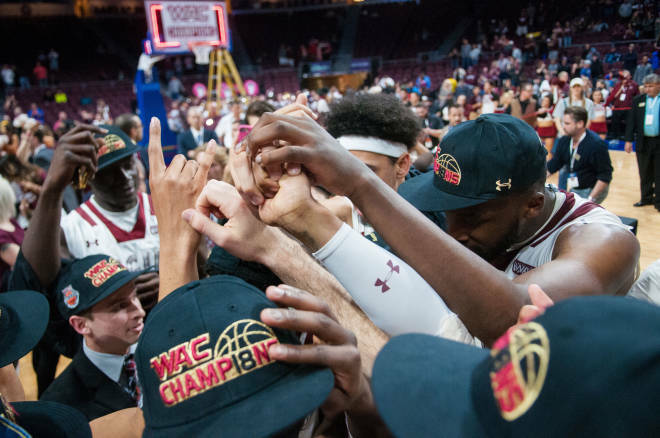 WAC home games tip off January 10 against the Grand Canyon University Antelopes, whom the Aggies beat last year in a squeaker to advance to the NCAA Tournament. Ticket prices vary by seat choice and opponent. Season tickets start at $150 (donation to the Aggie Athletic Club). Hot tip: If you’re looking for a selfie spot to share the Aggie pride, check out the new Pistol Pete statue, which presides on a bench outside Corbett Center Student Union. For ticket info, call the Pan Am Ticket Office at 575-646-1420.